How Should You Water Your Winter Lawn? Overwatering your lawn in winter could cause fungal diseasesbut not watering at all could be just as damaging. Are you still watering your lawn as if it was 100 ℉ degrees outside? If so, then now is the time to begin start cutting back. Watering your lawn the same way in fall as you do during the heat of summer can ignite a breakout of fungal diseases. These fungal diseases can then persist into spring and be very challenging to eradicate. What happens to waterlogged lawns? 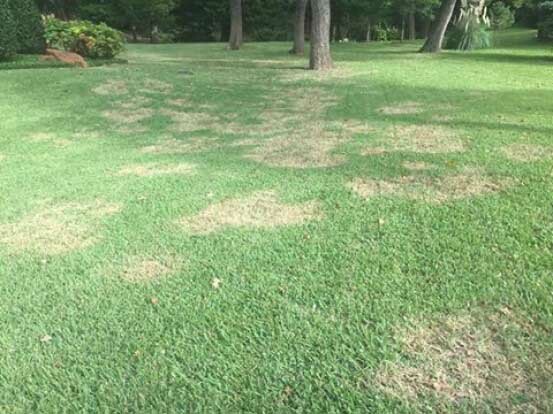 As our fall nighttime temperatures dip below 68 ℉ degrees, and humidity rises along with increased rainfall, diseases such as Brown Patch can take hold in your lawn. To make matters worse, lawns stressed from improper watering over summer, suffer from compacted soil or an excess amount of thatch are even more susceptible to fungal diseases. Does your lawn look like this? Then you could be overwatering your lawn. Disease Alert: What is Brown Patch disease? Brown Patch is caused by the fungus, Rhizoctonia solani. It thrives in lawns that are too damp and are stressed from drought, pests and other diseases. You can spot Brown Patch by the circular brown areas that appear in your lawn. The patches will vary in size, but the browned leaf blades will remain upright. If left unmanaged, the fungus can spread beyond repair, potentially causing you to have to replace parts of your lawn. It could also cause other issues that make your lawn more susceptible to the freezing temperatures this winter, and intense heat next summer. Should you stop watering your lawn now that the weather has cooled? Yes and no. Yes, you should reduce your watering and as the season progresses and temperatures drop. You might stop providing supplemental water all-together for a short period of time if there is regular rainfall; but don’t forget to run your system during extended dry periods. If we’ve received at least 1-inch worth of rain, then you don’t need to water your lawn that week. Reduce water: Warm season grasses such as St. Augustine, Bermuda or Zoysia will only need supplemental water during dry periods between winter rainfalls; and if they go dormant, they will only need to be watered every few weeks if there is no rainfall. In months of regular rainy weather, you may not need to water very much at all. If you have an automatic sprinkler system, be sure it’s not set to water your lawn multiple times per week during winter months. Also make sure that your rain/freeze sensor is working properly. Sometimes, we may advise turning off your system, and only running it manually as needed during a dry spell. Remember that every lawn is different, as is the soil in each yard. Some lawns will need a bit more water during winter while others may need less. There just isn’t a one-size-fits-all approach to watering lawns and landscapes. If you’re one of our landscape maintenance customers, we’ll work with you to make sure your lawn is watered the right way throughout each season. Now is the time to have your irrigation audited to ensure your system is working properly. A well-run system that is checked yearly in order to make any necessary repairs or adjustments will not overwater or underwater during our weather-extreme winters and summers. You’ll notice healthier plants, less water runoff and flooding, and a savings on your water bill.